Houghton Mifflin Harcourt, 9780544557192, 288pp. Move over, macarons; catch you later, cupcakes: Éclairs are the new pastry du jour. Delicious and adorable—and fun to make at home—these tiny treats are the perfect vehicles for all your favorite flavors (sweet and savory). Here, pastry chef Jenny McCoy shares incredible recipes for éclairs and all their relatives: cream puffs, profiteroles, Paris-Brests, religieuses, gougères, and more. The best part is that all of these creations are made from the same simple choux pastry: Once you master the basic recipe, it’s endlessly customizable, from Lemon Meringue Éclairs to “Whoopie Puffs” to New England “Lobster Rolls.” Recipes include traditional, fruity, chocolate, frozen, savory, and holiday-themed iterations, some classic, some clever—but all irresistible. JENNY McCOY is a former pastry chef at Craft, A Voce, Marc Forgione, and Emeril’s Delmonico whose work has been featured in Serious Eats, Food & Wine, The Kitchn, and more. She teaches at The Institute of Culinary Education and online at Craftsy.com. "Finally, an antidoe to cupcake fatigue: McCoy,a pastry chef, shows how éclairs can serve as a base for everything from ice cream sandwiches to lobster rolls." 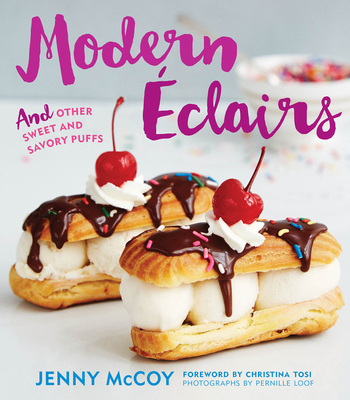 "Jenny's modernistic approach to the classic éclair is perfection—inventive, playful, and free-spirited. Her whimsical charm as a baker presents itself on every page."